To continue with the theme, Work With What You’ve Got for October 2012 I thought I would inventory the pantry for ingredients, specifically two cupboards of the pantry: our cooler and the cabinet below it. A cooler, in case some of you don’t know, is a cabinet that shares an outside wall with the house in which some of the wall has been replaced with screens that let outside air into the cabinet. This means you can keep condiments such as oil, honey, peanut butter, mustard and ketchup in the cooler instead of storing them in your refrigerator. We also use our cooler to store unopened jars of pickles, jams, pumpkin, evaporated milk, salsa, as well as opened vinegars and salad dressings. What this list of ingredients suggests to me is glazed meats and glazed fruit tarts to use up all of the apple jellies , salad dressings (as marinades), marmalade and mustard. Also Chinese food ( tamari, sesame oil, ginger, garlic, black vinegar). We also have the makings for cherry and pumpkin pies for Thanksgiving here. I did not go through the cupboard where we keep pasta, rice and beans, the baking cabinet, or the jars on top of the fridge which hold rice, tea and dried chiles or the freezer, which holds fruit, meat, butter, cooked food. 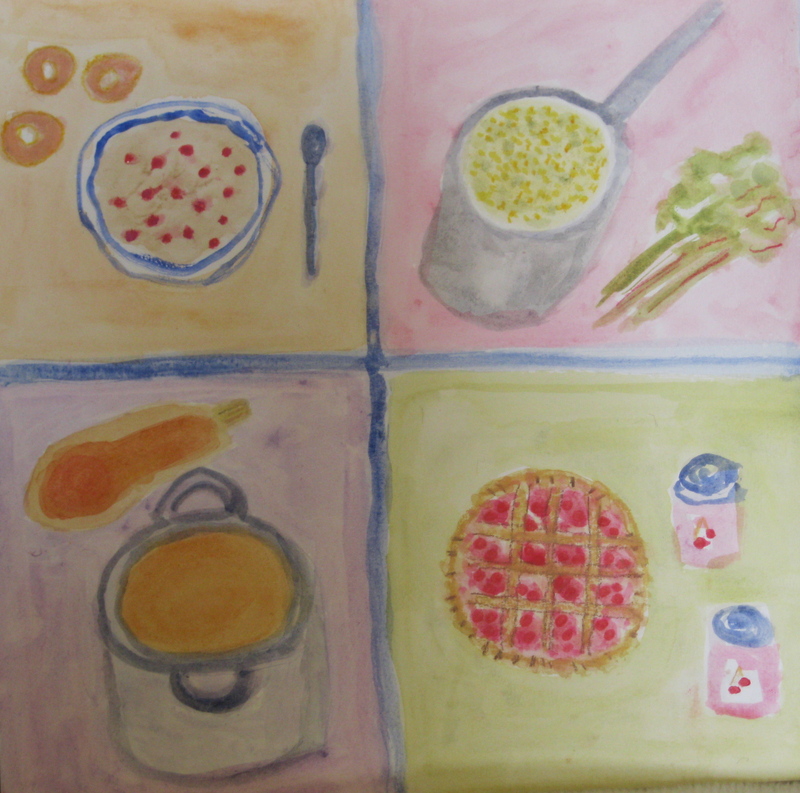 Four Dishes. 12″ x 12″ gouache and watercolor pencil on paper. Sharyn Dimmick. What I actually ate yesterday is this: my new Work With What You’ve Got breakfast is a mixture of rye flakes, rolled oats and granola, cooked in milk with home-dried apples and commercial dried cranberries and pistachios. I still have a large jar of dried apples from windfall Gravensteins I foraged in Berkeley. We still have apples on our tree, too. The cranberries and pistachios came from Canned Foods Grocery Outlet two visits ago , as did the rye flakes. I made the granola some time ago. We are running low on rolled oats, which is why I went to rye with the last three-quarters cup of oats mixed in — the granola is oat-based, too, and cooks up well. For lunch, I ate leftover chicken-vegetable soup that Mom made, with a whole wheat tortilla and a little bit of cheddar cheese, two cups of black tea with milk and the last homemade brownie (Mom baked while I was away for the weekend). For dinner, I took the last of the Riverdog Farm beet greens and turnip greens that had been languishing in the fridge, trimmed them and chopped them and cooked them in polenta. I threw in the salty cotija cheese that my sister-in-law had brought us and added some pecorino Romano and a pinch of red pepper flakes — it was a good way to eat plenty of greens for dinner without feeling like I had to eat them plain. I’ll eat the rest of the green polenta for lunch or for dinner tonight since no one else cared for it. Today I will be taking the last butternut squash from last year and turning it into butternut squash soup, roasting it in the oven while Mom makes lasagna. She said something about making a pie from the last of our current pie crust, too. Bryan only likes apple, pumpkin and coconut cream — maybe cherry — I’ll ask — maybe we can have a cherry pie (There are lots more cans of cherries in the garage). Food notes: Breakfast cereal: most cereals can be cooked and will mix well — I’ve eaten combinations of wheat, oats, corn and rye as well as eating each one as a separate cereal. Cooking the cereal in milk adds protein for staying power and assures you of getting calcium in your diet for your bones. Cooking cereal with dried fruits adds sweetness without adding table sugar (unless you are using pre-sweetened dried cranberries!). Nuts also add protein and good fat. Polenta: Polenta is versatile. You can eat it plain. You can stir cheese into it or tomatoes or peppers or greens or all four. You can eat it sliced and topped with marinara and cheese. You can eat it as a breakfast cereal with vanilla extract, milk and fresh or frozen fruit (see my polenta with peaches and Johnny’s polenta, a savory variation). Cornmeal or grits will do for polenta in a pinch — you’ll just get a slightly different texture. What would you eat if you were eating out of your stored food right now? What have you got on hand?